Several years ago, my husband and I watched a program on the History Channel that featured great storms. The blizzard of 1888 was one of those storms,that much snow at one time fascinated me mainly because we don't see that much snow in Houston. I began research and from the information I found my book, Summer Dream, was born. 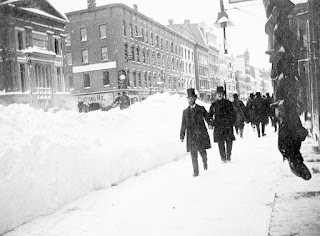 On this date in history, the greatest storm to ever hit the East Coast struck and became known as “The Great White Hurricane.” From Maine to New Jersey and even to Virginia, the storm raged dumping snow at an alarming rate that wreaked havoc in the cities along the coast and claimed the lives of over 400 people. In those days, weather forecasting was sporadic and not always as up to date as it should have been. Weather stations did dot the country but depended on the telegraph to send predictions down the line. Most of the area was without adequate warning to make preparations for the massive storm. This great storm was not predicted and people went about their normal lives, so it struck with little warning. Rain began to fall and quickly turned to sleet then heavy snow. Passenger trains stranded people who tried to get to work despite the storm. Some were even frozen to death as they attempted to get home. Rural areas found people snowbound inside their homes for nearly two weeks. In New York City, telegraph lines collapsed with the weight of the ice and knocked out communication in the city as well as the longer lines from Boston to Philadelphia. Because no transportation was available to bring in fresh foods, food was scarce as was fuel for cooking and heating. 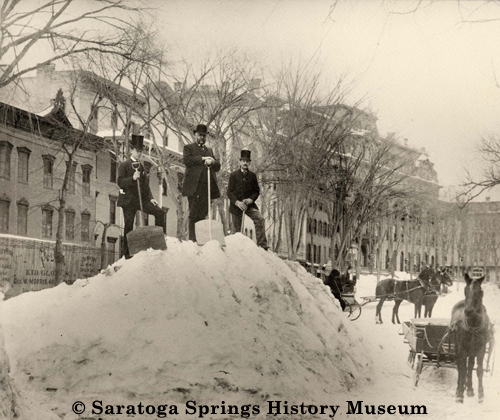 Records show that 35 inches of snow fell on New York City with drifts up to seven feet in many places. The storm struck Boston around 7 A.M. with a blinding snowfall and high winds said to have been around 50 miles per hour by 2 that afternoon. Although hard hit, Boston didn’t suffer nearly as much as the country around it. The days leading up to the storm were mild for the late winter days of early March with temperatures in the 40’s and 50’s along the coast. On March 10, the mild weather had people outdoors going about their daily routines looking forward to the end of winter and beginning of spring. Then on March 11, cold Arctic air from Canada collided with Gulf air and the temperatures began to plunge. By midnight the wind reached as high as 85 miles an hour with sustained winds in the 50’s. The map above shows the amount of snow in various areas with the darkest areas representing the most snow. The storm dumped as much as 50 inches of snow in some areas and caused a complete white out in New York City. That city alone saw 200 deaths from the storm. Cities like Keene, New Hampshire and New Haven, Connecticut also suffered with three to four feet of snow that claimed the lives of thousands of wild and farm animals. 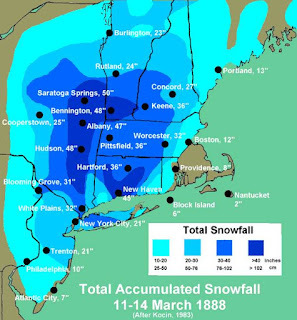 Many other storms have occurred with heavier snowfalls and lower temperatures, but the combination of inclement conditions has been unmatched in more than a century. 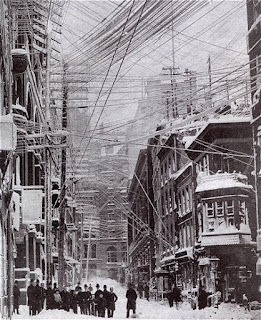 It paralyzed the Eastern seaboard snapping telegraph and telephone lines which isolated many of the towns from any form of communication. Ships were grounded and hundreds of lives lost. Because of the loss of communication, officials realized the danger of above ground telegraph, telephone, water, and gas lines. The elevated trains stranded around 15,000 people. These losses led to New York City and other towns to bury wires and gas and water lines below ground. Within ten years of the catastrophe, New York City began construction of an underground system that became the subway system still in use today. 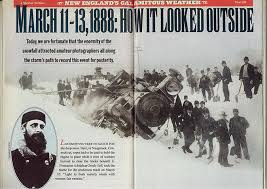 It also gave birth to the United States Weather Service that was begun in 1891.
Notable Americans affected by the storm include Senator Roscoe Conkling, New York’s Republican Party leader who collapsed in a snow drift and died. Mark Twin was stranded in a New York hotel for several days, and P.T. Barnum entertained stranded citizens at the Madison Square Garden. With an estimated property loss of $25 million, it was the most devastating storm to ever hit the East Coast. Many storms have come along since then, including the 1900 Galveston hurricane that claimed more lives, but the Great White Hurricane is one remaining on the record books. Have you ever been in a blizzard or extreme weather? How did you prepare for the storm? Tell me about your storm experience or one you know about and be in the drawing for a free copy of Summer Dream. Be sure to leave your email address so I can notify you. Rachel Winston is the daughter of a small town minister. Nathan Reed is a young lawyer who has not interest in a Christian girl because he believes God has forsaken him. Despite the attraction, until Nathan resolves the issues from his past, he has no chance with Rachel. After being caught in an unseasonable storm, Nathan lies near death in the Winston home, he finds the love and forgiveness he needs to return to his home make peace with his family, but is it a path taking him so far from Rachel that he loses her before he can return? 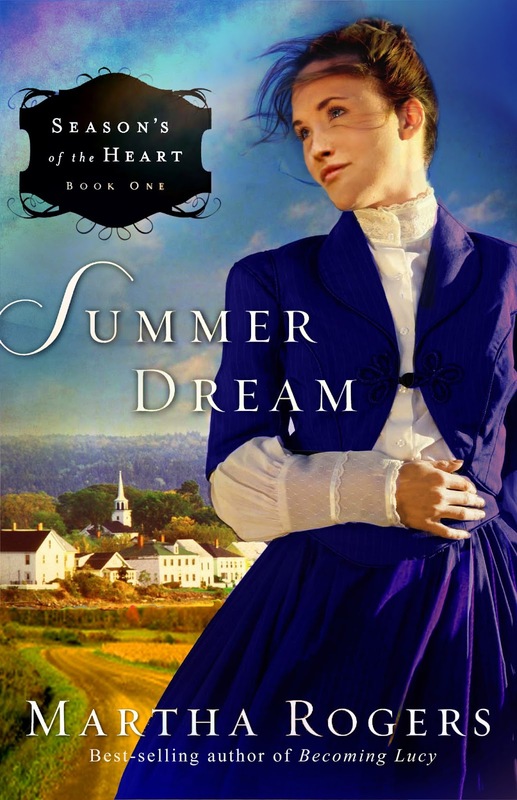 Martha Rogers is a free-lance writer and the author of the Winds Across the Prairie, Seasons of the Heart, and The Homeward Journey series as well as the novella, Key to Her Heart in River Walk Christmas and Not on the Menu in Sugar and Grits. She was named Writer of the Year at the Texas Christian Writers Conference in 2009 and is a member of ACFW. She writes the weekly Verse of the Week for the ACFW Loop. 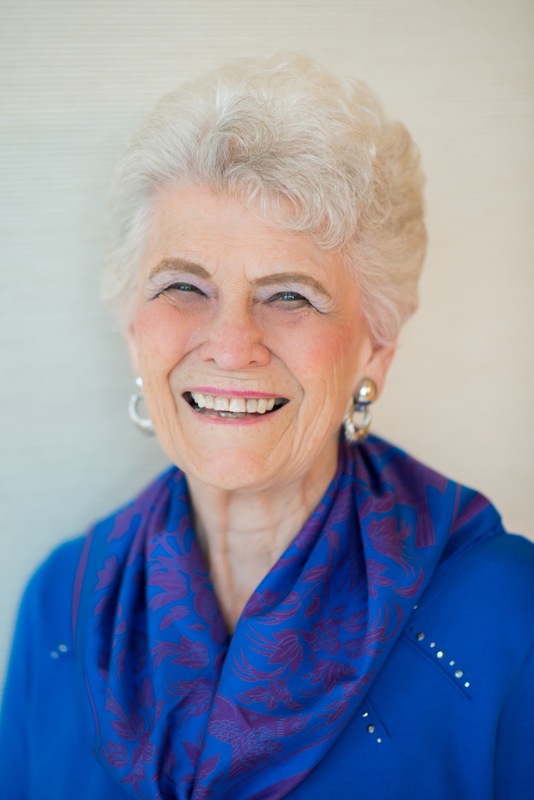 ACFW awarded her the Volunteer of the Year in 2014. Her first electronic series from Winged Publications, Love in the Bayou City of Texas, debuted in the spring of 2016. Martha is a frequent speaker for writing workshops and the Texas Christian Writers Conference. She is a retired teacher and lives in Houston with her husband, Rex. Their favorite pastime is spending time with their eleven grandchildren and three great-grandchildren. Wow, I can't imagine not having the warnings we get today. We have had quite a few snowstorms here in MI. Some have left us without power but we have always had food and water. I have never been in big snowstorm, but hurricanes are more common. :) Our biggest problem is being without electricity. Martha, we lived in the Rocky Mountains for going on 18 years, so, yes, we encountered some pretty severe winter storms. We kept emergency supplies on hand, in the car and in our home, for just such occasions. What I hated the most about bad snow storms was getting caught driving home in a blizzard, especially before the snow plows had gotten out to clear the road. Driving in the mountains unable to see the middle stripe with snow blowing almost horizontal? SCARY! O yes! In NYC as well. I was probably 9 or 10. Overnight the blizzard came and we were all covered! It was taller than me! Nowadays I would say nothing compared to that blizzard, but then I was smaller and shorter, so that could be the reason. I remembered we didn't have school for a whole week! My dad didn't have to go to work for about three days. When the snow stopped, my sisters and I went out and built a snowman and an attempted igloo, but it was more like a cave in our driveway (only space we had). On the third day, when my dad had to go to work, he was blocked in because of our little handiwork! It was funny! Now I'm in MD and the recent one here was scary! Interesting, Martha. That's how our Jan-Mar normally looks up here on the Canadian prairies, with some years more than others, and at least one blizzard a year. Two years ago, the snow in March was 6 feet high - taller than my husband. And this year, it's only come down a few times for a light dusting. The temps are also way above normal. Can I just say that I had a wonderful winter this year!! We start our winter preparation in the fall ensuring we have 6 x 5 gallon water bottles on hand and shelves of canned goods - especially proteins that don't require cooking. Lots of candles, too. We have kerosene lamps, but we don't like to keep the fluid near the house, and often forget to buy the modern bottled scented stuff. About five years ago, Oklahomans suffered through the ice storm of the century. We got several inches of ice, which snapped power lines, crushed roofs, and brought towns to a halt. Our power went out but my husband was able to buy a generator, so we kept our refrigerator and freezer running so we didn't lose all of our food. My oldest son's power went off, and he, his wife and young daughter stayed with us. We also brought my mom over because she, too, had no power. Fortunately, I have a gas stove, so cooking wasn't too challenging, as long as you did it before the sun set. I'll never forget the strange clacking sound the tree branches makde when the wind blew or the explosion of breaking branches. It was very pretty, but deadly. I remember that sound, Vickie. We had a terrible ice storm here in the Houston area, and the trees crackled and broke when they clacked against each other and the house. Hurricanes are one reason I've always had gas surface units to cook no matter what. Glad your family could all be together. We had to go to our son's house during Hurricane Ike. 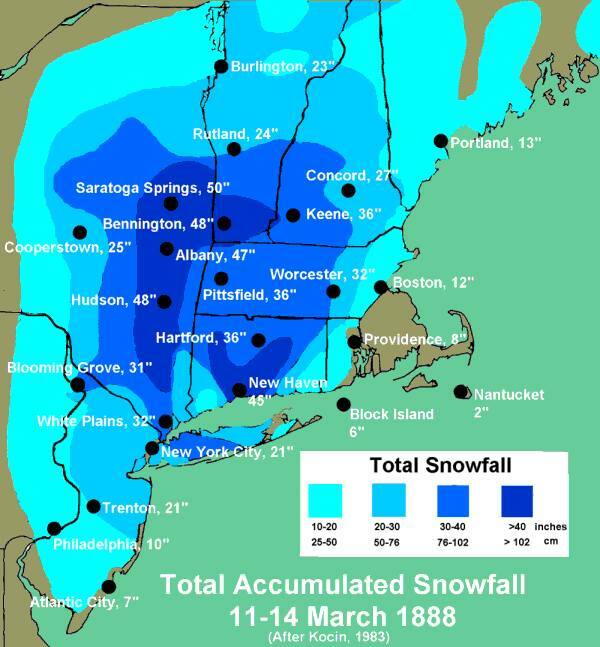 The Blizzard of '93 was a big one. We were without electricity for quite a few days. Fortunately, I have a gas range. I remember I had to cook up everything that was in my freezer. I gave away alot of food to the neighbors. We made the best of it.I mostly stayed in the house. All the men in the neighborhood went out to check on everyone to see if anyone needed help. We shared water with some neighbors who had wells in the rural area around us, because without electricity, they couldn't pump water. The hardest part was taking a bath. By the time I could heat enough water to get a few inches in the tub, the water would be lukewarm--LOL! Even though there were hardships for us, it wasn't life-threatening or really worrisome, as it might have been for others. I think electricity is the hardest thing to do without. We always store up bottled water and have gallon jugs filled with water in the garage for hurricane season. Your comment about the bathtub and water makes me wonder even more about our prairie ancestors and all they had to endure. I live in Eastern Washington and I remember a hurricane that swept through when I was about 8 years old. I had a ballet recital THAT NIGHT and I was sick with the flu! After the storm passed we were able to make it to town and I preformed that night! I remember being huddled up in our hallway and the winds folded our barn roof in half backwards! It was a crazy day! More recently we have been having really bad windstorms in our area. Last November right before Thanksgiving one swept through and wrecked havoc on many homes. We were thankful our worst damage was some shingles flying off our roof. God protected us and our home that day. My parents have often told me of a great blizzard that hit the Ohio Valley region when I was one year old. It paralyzed travel and everything came to a standstill. They were fortunate to live on a farm so they did have food available. Love this post, Martha! (Looks like home).